Join TIFF files into one. Save time, it's easy. You are here: CoolUtils > Total PDF Converter OCR > Join TIFF files into one. Save time, it's easy. When working with documents in image formats is very inconvenient to extract text from them. If you need to use the text information they contain, you have to retype it manually. Far more comfortable solution is offered by Total PDF Converter OCR that allows to convert image to text automatically, within a few mouse clicks. You can select one or several source files at once and convert all of them in one operation. For better convenience you can store all source files in one folder and select this folder in program navigation menu. Then you need only to set a few options for better results. Converting image to text you can chose one of text format that suits you most of all. This can be DOC, RTF, Excel, HTML, TXT or CSV. The range of options differs depending on the file type you select. For instance, converting image to TXT file, you will be offered to specify the text language – English, German, French, Italian, Dutch or Spanish. Also it is necessary to set the symbol for page break. This can be the end of line (0D0A), page break symbol (0C) or any other you prefer. As a variant, you can save each text page in separate file. Options settings can be skipped, if you don’t really sure which ones to specify. In this case the application will perform conversion in default mode. It is rather convenient, you will see the folder with converted copies opened, where you can revise the result and repeat conversion if there will be something you like to change. Total PDF Converter OCR offers a few working modes, so any user can select one comfortable for his needs and skills. You can even enable the app using the command line. 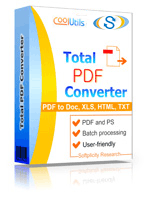 Total PDF Converter OCR provides with excellent easiness in use and fast operating extraction of text from image files. Buy it online: unlimited term of use and number of conversions is guaranteed! How to export scanned PDF files (OCR)?